Southern California was hit by a 5.4 magnitude earthquake late Tuesday morning, swaying buildings in downtown Los Angeles for several seconds. 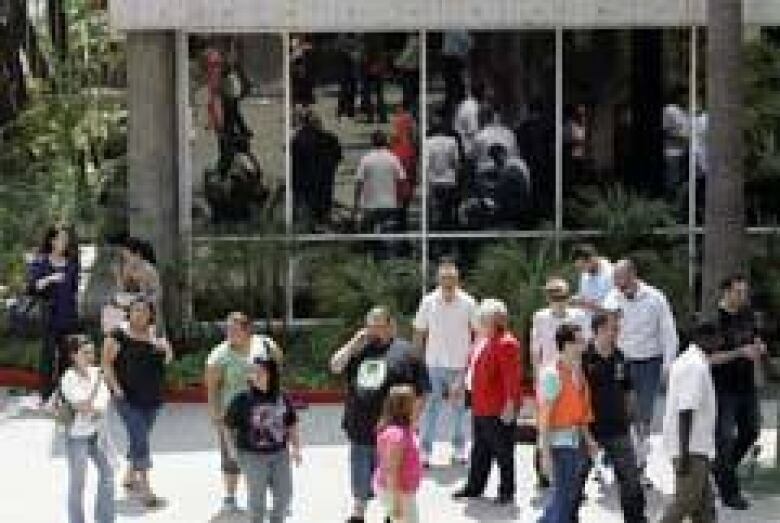 People wait outside a downtown Los Angeles building after an earthquake on Tuesday. The jolt was felt from Los Angeles to San Diego, and slightly in Las Vegas. ((Kim Johnson Flodin/Associated Press))Southern California was hit by a 5.4 magnitude earthquake late Tuesday morning, swaying buildings in downtown Los Angeles for several seconds. There were no immediate reports of damage or injuries during the quake, which struck at 11:42 a.m. PT and was reportedly felt from Los Angeles to San Diego and slightly in Las Vegas. Workers were told to leave some office buildings in Los Angeles. The U.S. Geological Survey estimated the quake was centred about 45 kilometres southeast of downtown Los Angeles near Chino Hills. "We had forgotten what a big earthquake felt like, at least I did," seismologist Kate Hutton at the USGS office in nearby Pasadena told the Associated Press. "It's a drill for the big one that's going to happen someday." At least 24 aftershocks with three measuring 3.8 in magnitude were also recorded. In comparison, the 1994 Northridge earthquake under Los Angeles's San Fernando Valley had a magnitude of 6.7. It killed 72 people, injured more than 9,000 and caused $25 billion US in damage in the metropolitan area. "We were all just sitting in the newsroom and then everything started shaking and we all ran under our desks," Jia-Rui Chong, a reporter with the Los Angeles Times, told CBC News. "It lasted for quite a while, [for] at least about seven or eight minutes we were all under our desks," she said. "We have earthquakes here all the time and sometimes it feels like a truck driving in your building or something but this one was a lot bigger," she said. So far, there have been no flight delays or cancellations at Los Angeles International Airport.